After clicking "No account yet? Create a new one! ", the user is asked to enter his personal data. If a user was invited to SMASHDOCs by another user, he gets an e-mail with a link. Following it the user reaches the registration page. In this case it is not possible to register with a different e-mail than the one received in the invitation e-mail. 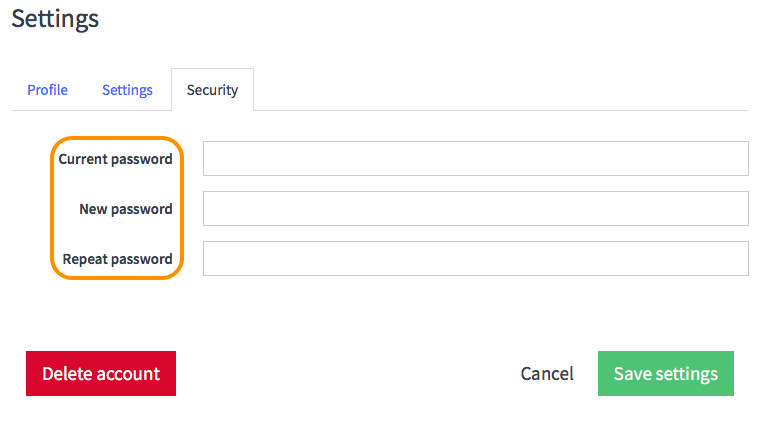 A user needs to complete registration as described in the previous chapter to log in to SMASHDOCs. In order to log in the user has to enter e-mail address and password on the SMASHDOCs homepage and click on the login button to access. The document list is the first interface user sees after the login. It shows an overview of all documents that he created himself or participates in. 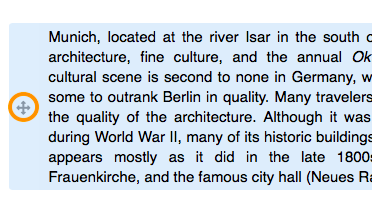 If user is new to SMASHDOCs, first thing he receives is a guide about our city of residence Munich in order to get acquainted with SMASHDOCs format. When selecting a document from the list, it opens in a new browser tab. You can create new documents by clicking the green plus-button on the downright corner of the page. For further information about creating documents, please refer to chapter 3 of the manual. Documents in draft mode can solely be accessed and edited by the creator. The system does log changes to the content if a user presses the blue button "Track changes" in the top header of the document. This button is only visible if there is 1 active user in the document including all deactivated users. Other users can neither read nor edit the document. 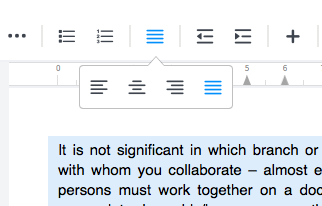 To add further users to a draft document, the creator has to share the document for review by pressing the green "Share" button in the top header of the document. In review mode all content changes are tracked, documented and displayed in the change view. The creator can grant other users access to the document and confer different editing rights (see also chapter 5). User should move the cursor over an entry in the document list to display the context menu on the right side. Depending on his role and further permissions the options displayed in the context menu vary for each user. The context menu of documents holds the following options. NB. User can only edit the meta data of a document if he has administrator rights. The column on the left indicates if there are any news in documents by displaying a red number next to "My news". "My news" only shows if there are unseen changes, pending decisions or unread conversations in review documents user contributes to. If none of the above criteria are met, the meter with number of documents containing news is not displayed. Documents with many changes do only count once. The symbol for unseen changes is also shown in the "News" column of the document list. The column "Unopened" on the left also indicates if there are documents that the user got invited to, but has not opened yet. The red meter next to it shows the number of unopened documents. As soon as the user opens a document, the status "Unopened" is adjusted automatically. The symbol for unopened documents is also shown in the "Unopened" column of the document list. User can bookmark each document in the document list that he created himself or contributes to. If there is at least one document with a bookmark, "My bookmarks" is shown in the column on the left. The meter shows the number of bookmarked documents. The symbol has different colors, depending on the status. When setting a bookmark, user can specify a due date in the input field that appears. When a bookmark reaches its due date the meter turns red and so does the star symbol at the document. When there are only documents with upcoming due dates the meter is grey. NB: Bookmarks are only visible to the user who set them and can therefore only be changed or deactivated by that user. The number of the listed document adjusts depending on the chosen filter. 2.2.1The standard folder "My documents"
The "My documents" folder in the document list helps the user to manage and structure his documents within SMASHDOCs. This folder can neither be deleted nor renamed. It serves as standard filing for all documents that a user created or got invited to. Within this folder, user can create new folders on different hierarchy levels to structure documents thematically, according to projects, etc. Using the "My documents" context menu user can create new folders on the highest hierarchy level. Folders on lower hierarchical levels can be created accordingly via the 'subfolders' context menu. Two folders with identical names can be not created on the same level. In this case, a warning shows and asks to choose a new folder name. User can move folders within SMASHDOCs via Drag & Drop by selecting the folder he wants to move and dragging it to its new position. If there are already folders on the same hierarchy level, the relocated folder will be alphabetically sorted into the structure. Any subfolders move along with the relocated folder to maintain the hierarchy. Here again, it is impossible to move two identically named folders on the same level. In this case, a warning appears. Folders with identical names are also not possible when editing a folder. When user deletes a folder, the documents contained are moved to the "My documents" folder. You can also move single documents via Drag & Drop. 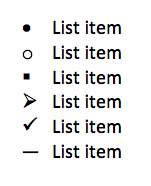 Select an object from the list and drop it into the desired folder on the left. The search function can be accessed via the document list. Clicking on the magnifier in the page header opens the search dialogue. The search function can also be accessed via "Search" in the column on the left side. The search scans documents as well as folders and document tags for matches with one or multiple search terms. Under each document in the result list user can see the respective folder path. To directly open a folder and show all documents within, just click on the folder name in the search results. To search for documents, enter one or more search terms. Documents that match those terms appear in the result list together with other types of results (folders & tags). Click on the filter "Documents" on the upper right side of the search window to only show the document results. Clicking on a document from the list opens it in a new tab. Search for folders by entering one or more search terms. Folders matching those criteria appear in the result list with other types of results. Click on the filter "Folder" on the upper right side of the search window to only show the folder results. Clicking on a folder from the result list opens it in the same tab and shows all documents within. If a document got tagged, these tags are also shown in the search results. Selecting a tag not only shows the user all documents marked with this tag, but also a list of all tags combined with the selected tag. Another click on a tag from the list adds it as a search term and further narrows down the search. You can delete a tag from the search terms at any time. The result list adjusts automatically. In SMASHDOCs a new document is always created in draft mode. The creator works on a document by himself. Changes of the content or document structure are tracked if a user presses the button "Track changes" in the top header of the document. In this mode the user works on the document on his own. For a short explanation of the different editing states see chapter 2.1.2 . In order to create a document, a user has to click on the green plus button on the downright corner of the document view and select "Write new SMASHDOC" from the appearing dialogue or use a shortcut (Ctrl + Shift + N) for Windows / (CONTROL + SHIFT + N) for Mac users. In this dialogue, you can enter the document's meta data. By clicking "Create document" the new SMASHDOC is saved in the folder where it has been created and can be edited. The core characteristic of a document in SMASHDOCs is that it is divided into different sections. This makes it easy for documents in review mode to make changes to the content, track them in the versions of a section and approve them. Hitting ENTER in a draft document creates a new section. Every section has specific properties concerning formatting and outline levels. The definition of every section's outline level makes it possible to create a document with a logical structure - at any time. Illogical structures within a document, like e.g. an inconsistent outline numbering are not possible in SMASHDOCs. The formatting information let the user create sections with different properties such as headings or lists. Documents can also contain images and tables. They do not have any formatting properties. Every image or table gets a number in chronological order, and the user can add image or table captions. Apart from creating new documents directly in SMASHDOCs, users can also import an existing Word file in .docx format into SMASHDOCs. Documents in .doc format are not supported. After clicking the green plus-button downright in the document view user has an option to "Import MS Word document" in the appearing dialogue . In the following, you can either insert a document via Drag & Drop or browse for a document on your local drive. In a second step, the user can determine how an identified Word formatting template will be processed in SMASHDOCs. By default SMASHDOCs formats the respective sections automatically. 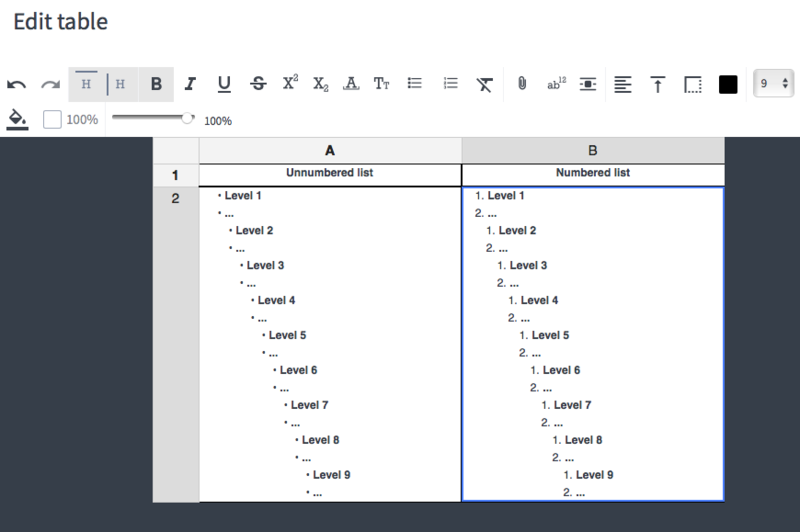 To be able to map WORD with SD styles and / or modify the outline levels for headings and numbered paragraphs manually, the user should activate the checkbox "Manual Mapping". In case no changes were made by the user, then SMASHDOCs automatically formats the respective sections accordingly to default settings. In the next step the user can edit the document's metadata after clicking "Import " button. SMASHDOCs creates a new document out of user's Word file, with all formatting attributes setted specifications (if they are technically recognizable and convertable). Afterwards, you can edit the document as a draft and share it for review as you would do with a document created directly in SMASHDOCs. The procedure of importing sdox file into SMASHDOCs is the same as for importing Word document. To see the detailed guide, please go to chapter 3.1.1.2. After establishing a new document, the user can easily create new sections. A new draft document always holds one empty standard section. A user can add content and write text by clicking into the empty section. Hitting ENTER creates further new sections. The procedure of adding new sections to an imported document is the same. SMASHDOCs automatically and continuously saves new changes in a document. New sections do not have to contain text, but you can also save them as empty sections. In the document they are displayed as whitespace. If a user wrote something and made a mistake, he can erase (undo) it using the Cmd+Z for Mac / Ctrl+Z for Windows = "Undo" shortcut. Undo action deletes the last written word in the section. The number of undos is limited only by the number of words within the editing section. But after inserting weblink/cross-reference/footnote it and the text before can not be undone. Note: If leaving the editing section or clicking outside of it, making changes and then closing the document or program any changes that were made earlier cannot be undone. Every undo action can also be redone Cmd + Shift + Z for Mac / Ctrl + Shift + Z for Windows. Redo can be performed immediately after the previously undone action. The number of redos is limited only by the number of performed undos. Every list item in the document has the option „Magic tabs». 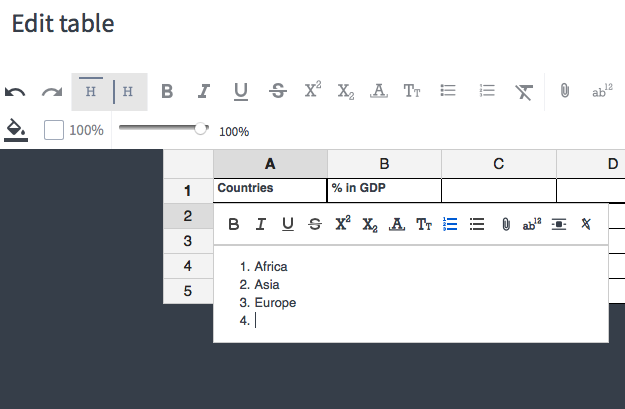 If the option «Magic tabs» is „on” in the document, the content of the list item starts at the next global grid tab. To turn on the “magic tabs” the user has to open the tab “Show document options” in the tab bar left and to put a hack in the small box right next to it. If the user unhacks the box the option “Magic tabs” will be turned off. 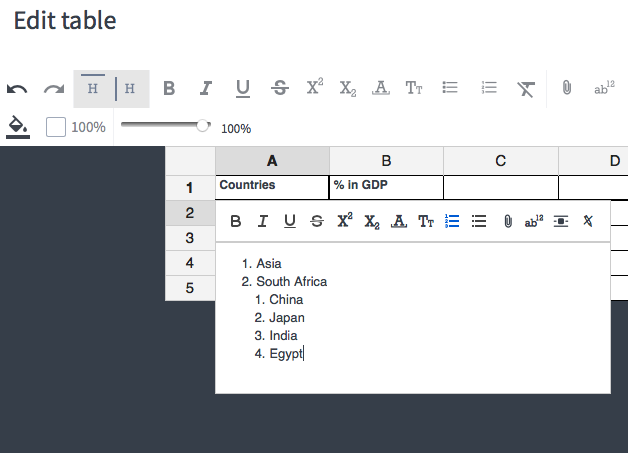 Activating "Magic tabs" provides the user with the possibility to organize the content in his lists according to global grid levels set in the document. See the differences with magic tabs "off" Image 30 and magic tabs "on" Image 31. Under Windows, any Unicode character with the corresponding codepoint table can be entered directly from the keyboard; e.g. for → (arrow to the right) key combination: Alt + 26. 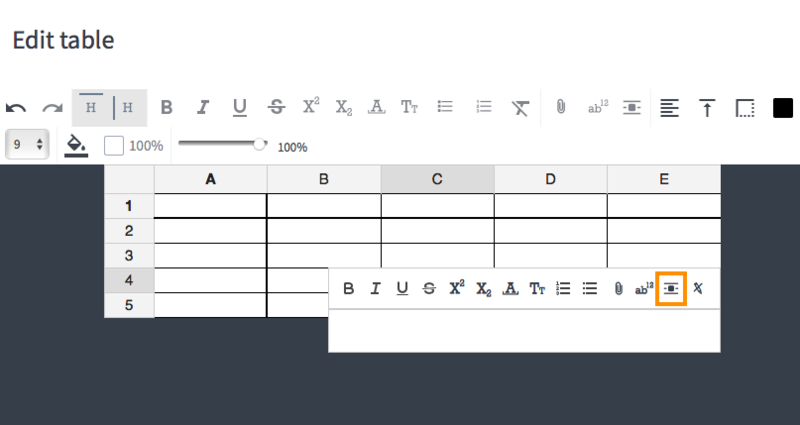 On Mac, you can use the system extension "Keyboard overview", the clipboard (for example, from List of Unicode characters), or the SD special character table for input. Quick Start menus mean one or a few groups of paragraph styles fixed in the tab bar with the default or custom icons. Usually, these include mostly used styles that therefore should be accesed easier and quicker. Quick Start Menus are configurable for each system individually. A document can also contain images. There are several options to insert an image into a document. Click into the section that you want to add the image below. Afterwards, click on the "Insert image" button in your formatting bar. For manually uploading an image a user has to open computer's file browser by clicking on "browse" and search for the desired image. For inserting an image via Drag & Drop, a user opens image from PC's file storage and drags it into the defined area within the dialogue box. SMASHDOCs uploads the image automatically. After uploading a picture user can add an image title. After saving the image, the title appears below it and in the list of figures. User can decide for each image individually whether to number it. Unnumbered images do not count for the ongoing numbering but still appear in the table of images. If the numbering is active, users can choose the numbering level: first (1. ), second (1.1). It is also possible to directly insert an image into the document by choosing an image from local file storage and draging it to the respective position in the document. SMASHDOCs automatically creates an image section and opens the window for entering a title. If a user clicks outside the dialogue window without inserting or saving an image, the process gets cancelled, and the empty image section disappears. Unlike text sections, image sections do not have any formatting or additional properties. 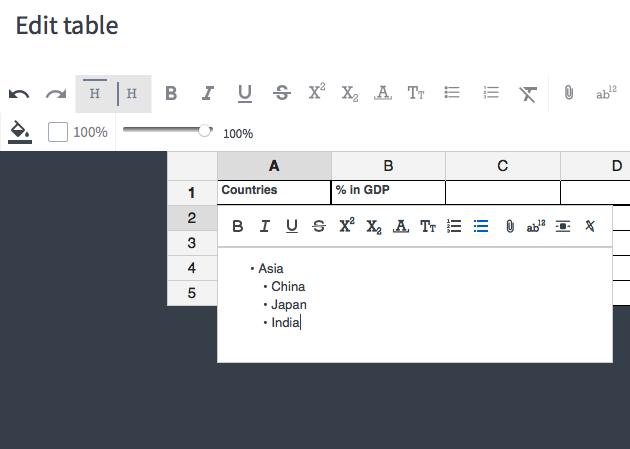 In addition to texts and images, users can also insert tables into a SMASHDOCs document. 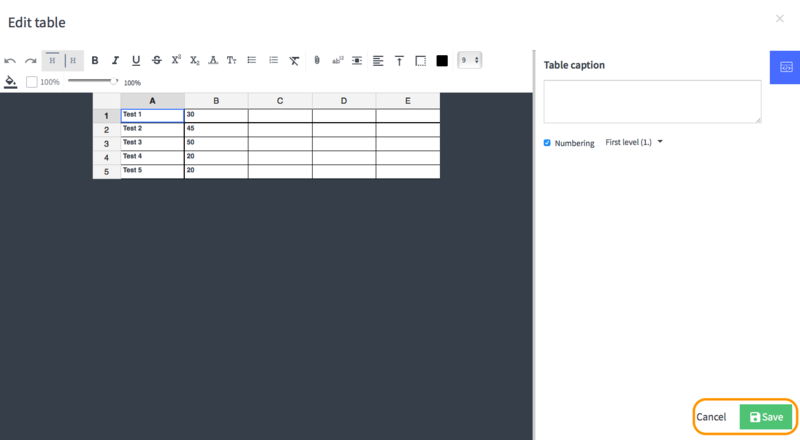 Just like images, user can create table sections either right under a selected section or create a new empty section that will be transformed into a table section. Also there is a possibility to create tables using the "Insert table" button in the formatting bar. A user can edit the table in the appearing dialogue window. 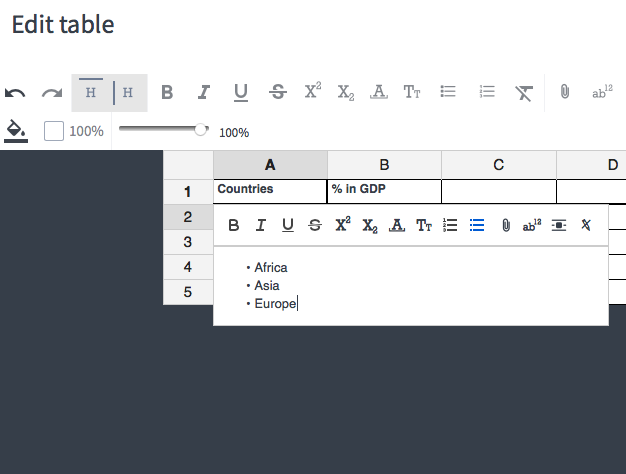 It is possible to mark the first row and column bold as a header, adjust the table's overall size and add a caption. Furthermore a user can adjust the formatting for every cell individually in the formatting bar on the dialogue box's upper margin. Right-clicking into a cell or double-finger clicking for Mac users opens the menu for adding, merging and deleting rows and columns. Move one or more rows of columns by marking them and dragging them to their new position. Like for images, table numbering is optional. Tables without numbering still appear in the list of figures. It is also possible to process content from Excel tables in SMASHDOCs. Just copy the content in Excel and paste it in a SMASHDOCs table. Like image sections, table sections do not have any formatting or additional properties. With SMASHDOCs it is possible to integrate web links into documents. A user can add web links in text sections but not headings. There are two ways to create a link: a user can either select text and link the highlighted text or insert a link without selecting text in advance. In this case, the link is placed at cursor's position in a text section and the user can define the link text himself. Enter the respective link into the lower field of the appearing dialogue window. In the upper field, the user can determine how the link is displayed in your document. If you highlighted text when clicking the "Add link" button, this text automatically shows up in this entry field. 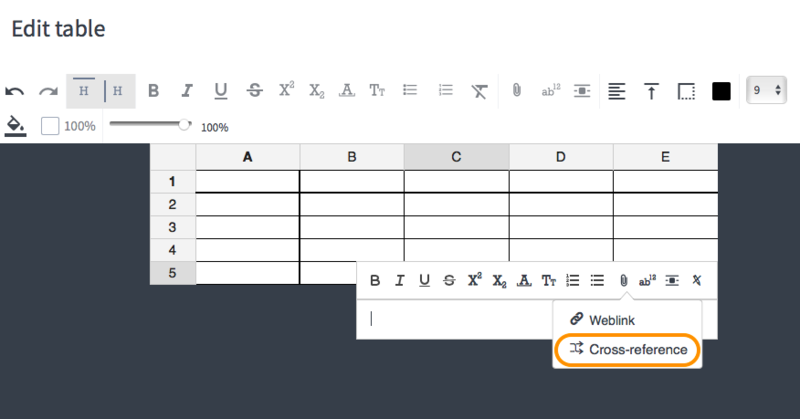 Apart from weblinks, a user can also add cross-references within a document. A dialogue window opens, where the user can select the reference target and decide if only to display the number of the respective section or also its text in the reference. The options "Edit" and "Delete" are only available for users with the role "Approver" or "Editor". After inserting a cross-reference, a little symbol appears to the right of the section the cross-references has been inserted. Click on it and a detailed list of all cross-references in the respective section will appear. An inserted cross-reference is not only displayed beside the section the cross-reference was inserted, but also next to the section it refers to. When content is inserted or deleted and thus changes the numbering sequence of the document, SMASHDOCs checks immediately with all cross-references and adjusts accordingly. The moment a broken cross-reference occurs, a red tab with an exclamation mark appears in the tab bar. Simply click on the exclamation mark and SMASHDOCs shows the list of all sections which contain broken cross-references. Select an item from the list and SMASHDOCs navigates the user directly to the exact sentence where the broken cross-reference occurs. This allows quickly solve the problem by inserting a reference or deleting it. 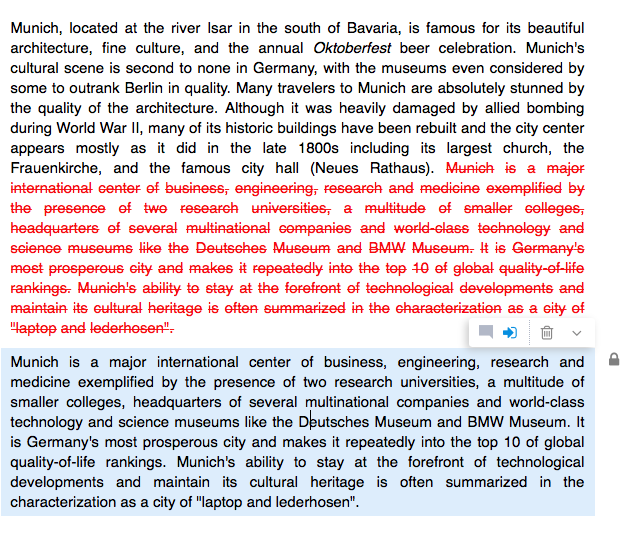 Once there are no broken cross-references in document, the red exclamation mark disappears from the tab bar immediately. NB: A user can only cross-reference to sections of one and the same document. It is not possible to cross-reference to other documents. The document can also contain inline images. A user is able to create, edit and delete inline images in text sections and tables. 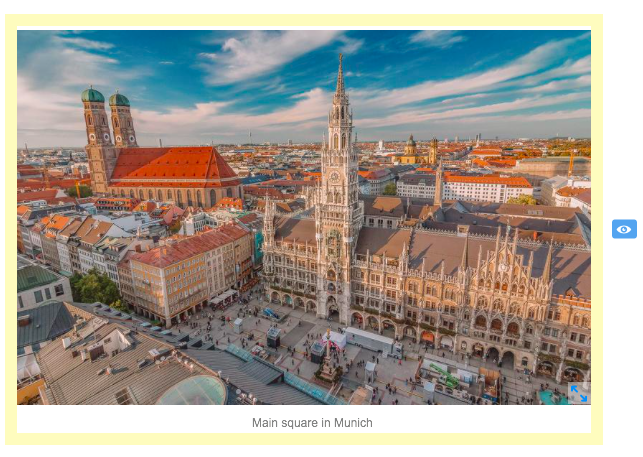 To create a new inline image, click into the text section spot where you want to add the inline image. Afterwards, click on the "Insert inline image" button in your formatting bar. and see a preview. 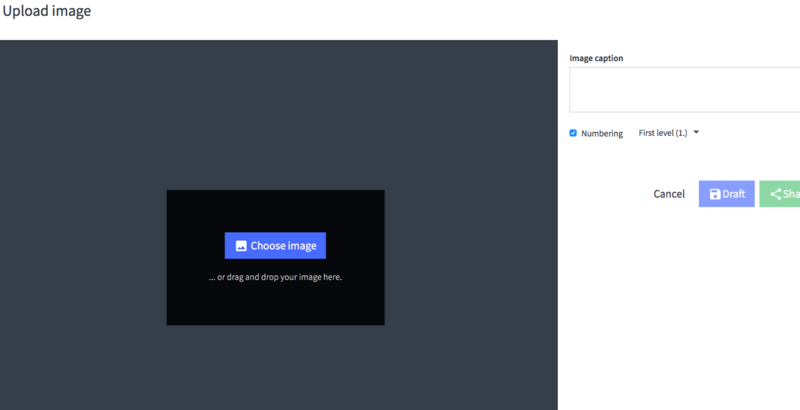 Basically, the process of uploading an inline image is the same as for creating and updating an ordinary image section. A user is also able to enlarge the particular inline image in the text section just by clicking on it. Creating an inline image is also possible in the table editor, where you firstly double-click into the desired cell in order to activate Enhanced Table Editor and then click on “Create new inline image” icon. If a text section contains a changed inline image, the last seen version of the inline image is displayed and framed in red and the latest version of the inline image is displayed too and framed in green. Even if there were multiple changes to the inline image, the user only sees the last version of the inline image he saw and the latest uploaded version highlighted in red and green respectively. To see the inline image history, click on the "Click to see revision history to section" on the right side of the text section. Furthermore, the list of image sections in the document will also contain the list of inline images inserted in the text setion. After a click on a list entry, the document scrolls to the related text section containing the selected inline image and activates the section in the document. A checkbox can be used in the form-based documents or to indicate something as "yes" or "no", "done" and "not done yet" e.g. in the to do list. To tick or untick the checkbox a user simply clicks on it. The check / uncheck are tracked if shared for review. The checkbox can be deleted via the Backspace key. With section links a user can create a direct link to any section in a document. Open a section's context menu with a right click and choose the function "Display section link". The URL belonging to that section shows in a dialogue box. The procedure of inserting the section link into a document is the same as for creating a weblink. Clicking on the section link lets a user navigate right to the respective section. A user can also insert section links outside of SMASHDOCs or send them via e-mail. Clicking on the link opens the document and jumps to the correct section. Footnotes are numbered consecutively. To quickly show a footnote choose the tab "footnotes" in the table of contents. Clicking on an entry navigates a user to the respective section. In addition to weblinks, cross-references to other sections within a table can also be created. 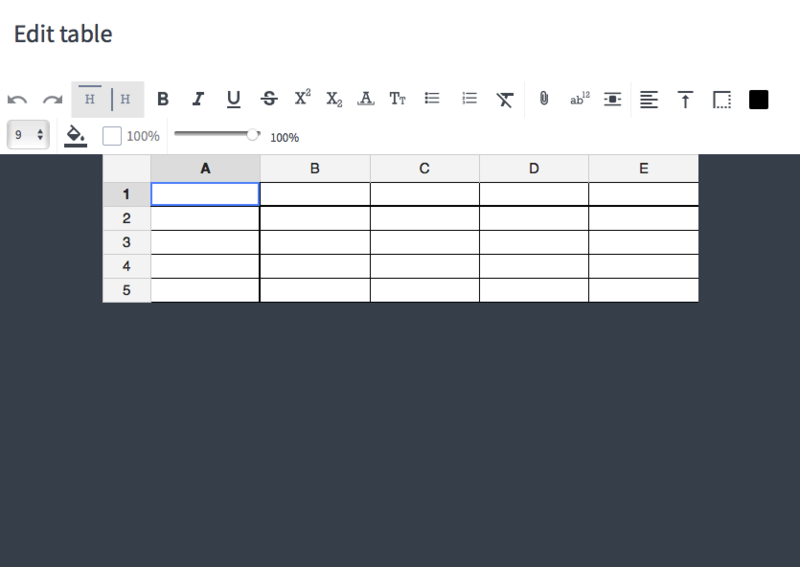 To insert a cross-reference, click twice in a table on the cell in which the cross-reference should be inserted and then on the button "Create a link". In the menu that appears, select "Cross-reference". A dialog window opens. Here the user selects the goal of the cross-reference and specifies whether only the number of the respective section and / or the text contained in it should be displayed in the cross-reference. Then click on the "Create button" and cross-reference will be created. Clicking on a set cross-reference opens a dialog window to the right of the table, in which several options are available when dealing with the cross-reference. NB: Cross-references can currently only be created within a document and can not refer to other SMASHDOCs documents or sections in other SMASHDOCs documents. Footnotes can be added to the context within tables. To do this, the user should click on the active cell, where the footnote will be located and chose foortone icon on the formatting bar. The footnote appears in a list of footnotes. After importing, the footnote appears at the bottom of the page of the .docx document. Users can create multi-level lists within tables. To list the items, activate the cell, where the list should appear, highlight the text and press list button. There are 2 types of lists: numbered and unnumbered. To go to the next level, insert cursor just before the text that should be moved and hit the TAB button, the text will be numbered one level futher from the left. Lists can be taken up to 9th level maximum. It is up to the user how the groups should be displayed. By clicking on the three dots button, he can choose whether to expand all groups, collapse all groups or activate auto-collapse. 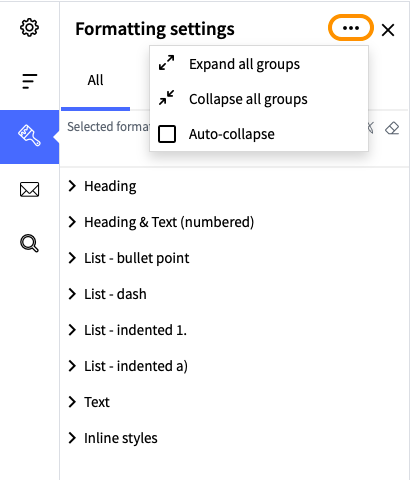 The formatting selected for the text section is also displayed in the selected formatting window and highlighted blue amongst other styles in the respective group. But if the auto-collapse or collapse of all groups are activated, only the group with the chosen style will be highlighted blue. The user can see the format`s name either in the selected formatting window or open the collapsed group manually. If the user clicks on the paragraph and then selects a paragraph style, the entire paragraph will be formatted accordingly. If the user selects the inline style and the cursor is positioned on one word, only the selected word will be formatted. To format the entire section, the user should first mark the section completely and then apply the selected inline style. Whereas the inline styles are universal for all users, the list of paragraph styles depends on the particular system. A user can also use shortcuts for inline styles. To activate the functions a user either marks a complete section or selects individual words and clicks on the formatting buttons or uses the shortcuts provided in the following table. The individual formatting options do not work on headings, numbered headings or tables. To learn how to format one of those elements, please refer to chapter 3.2 . 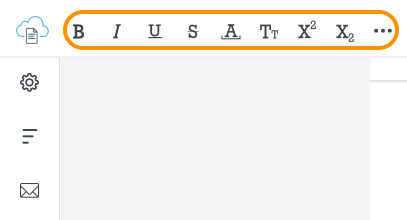 In SMASHDOCs a user can determine different formatting attributes or additional properties for each text sections. These properties make it possible to structure a document content or to apply a predefined attribute like font size to a section. This also applies when the user wants to turn document content into headings, numbered headings or lists. A standard text section does not have any additional properties and is displayed and processed purely as text. Text sections with the property "Heading without outline numbering" can serve as structuring elements for example of a chapter and are displayed in bold and a different font size than standard text sections. The property "Headings with outline numberings" turns a text section into a heading and adds a numbering. When moving such a section, the numbering adjusts automatically to the logical document structure. "Text with outline numbering" adds a numbering to text sections. Together with numbered headings, those sections form the complete numbering structure of a document. Text sections that are formatted as lists either contain bullet points (unnumbered lists) or numbers (numbered lists). The numbering of lists is independent of a document's outline numbering. Each sequential number is treated as an individual text section. When the sections' order changes, the numbering adjust automatically. Numbered lists can be placed on 6 levels. There are advanced options for formatting numbered lists (see Image 69), available for subscribed users upon request. For further information do not hesitate to contact smartwork solutions. Also there is an advanced option to configurate the signs of unnumbered list with the help of special decorators. This option available only for subscribed users upon request. Feel free to contact smartwork solutions for further information. Formatting attributes can be activated and changed as desired via the respective icon in the formatting bar. To format a section, select it by clicking at a random spot within the section. A user can now assign a formatting attribute with a click on the respective button. Change or deactivate the formatting by clicking on another or the same button once again. For every formatting attribute, there is a default setting. After activating it, SMASHDOCs applies this default setting to the respective section. Image sections in SMASHDOCs do not hold any formatting options or additional attributes besides a size adjustment. In order to edit the size of an image in the document, click on the little blue arrows in the lower right corner of the inserted image, hold the mouse key and move the image to the desired size. In this way, the user can enlarge or reduce the size as required. Changes of the image size are saved automatically as soon as the mouse key is released. Tables in SMASHDOCs hold various formatting options. They appear after opening the dialogue box for editing tables. The page break appears above the selected section. As a SMASHDOCs document is not displayed pagewise, the break only shows as a marking. When exporting the document (e.g. Word) the page break appears at the position. To delete page break, select "Delete page break" in the section context menu. SMASHDOCs allows to change a section's position within a document without disrupting the correct outline numbering. When clicking into a section in a draft document, a "Move" button appears on the left side of the section. Click on the button and hold the mouse key to move the selected section to any position within your document. Let go of the mouse key to fixate the section at the desired position. After having relocated sections or groups of sections, the outline numbering adjusts automatically. A user can also move sections in review mode via the "Move" button. A user can also move sections horizontally via the "Indent" button in the formatting bar or by pressing the Tab key. This indents the selected section to the next possible level. A user can outdent sections by pressing Shift + Tab. 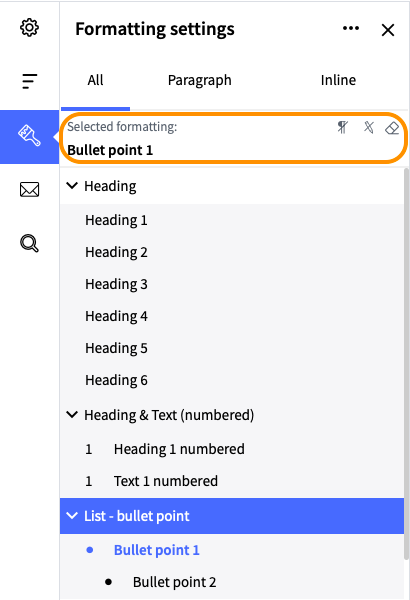 SMASHDOCs' table of contents shows all text sections with the format "headings" or "numbered headings" at a glance. It also lets a user easily locate specific sections and provides quick access to the respective position in the document. As per default, only headings with outline numbering are displayed in the table of contents. Clicking in the "H" in the upper right corner adds unnumbered headings (if existing). When you add numbered sections or change the numbering or outline level within a document, the table of contents updates automatically. Image sections and tables are also displayed in the table of contents. the user can access the overview by clicking on the respective tab in the header. The table of contents exists in draft as well as in review mode. Free positionable directories meaning the lists of all objects of one type belonging together, thus ordered according to their position in the document as the table of content, list of figures and list of tables can be added anywhere in the text. Besides, directories can also be moved to any other spot later on same as the ordinary text section. One click on the directory opens it on the left side of the tab bar with all the relevant content inside. E.g. clicking on the list of figures directory opens it in the "Show directory" tab. Note that inserted free positionable directories will always appear in the exported document unlike standard table of contents that can be deactivated for the export version. Only the creator can set a draft document to review. It is possible to add users to a document when sharing the document for review and at any later point in time. 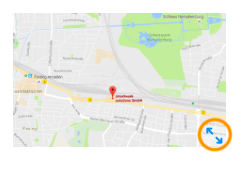 To send an invitation user has to insert a person's e-mail address. Users with whom the creator already cooperated within SMASHDOCs can easily be found by searching for their first / last name or e-mail adress. In review mode, all changes and decisions for every section are tracked, and recent changes are displayed in the change view. New changes as well as approved or rejected suggestions are highlighted in colour, provided that a user has not seen or marked them as seen yet. 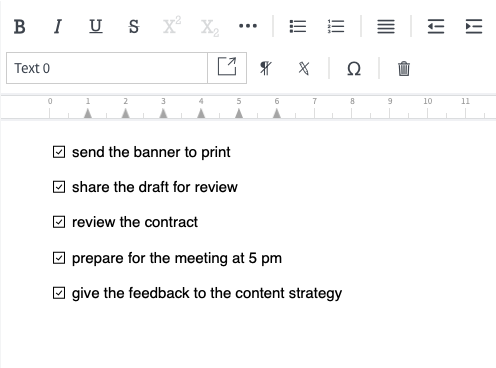 The creator of the document can start the review mode directly from within draft mode. NB: To edit sections and saving changes, a user needs to at least have the role of "Editor". In order to save new changes in the section a user can use the shortcut (Ctrl +S) for Windows / (COMMAND+ S) for Mac. A document's content can also be edited after having started the review mode. A user can edit each section individually by clicking into it, after this changing the content is possible. It is not possible to edit sections simultaneously: once the user started the editing mode for a section, no other participants can edit this section until he finishes. Once the editing mode was started, the user can make changes in the desired section, while the changes are displayed immediately. The text can be passed from other SMASHDOCs documents as well as from external sources (e.g. websites or Word documents). All changes are saved automatically, even when you click outside the section. Alternatively, the user can click on the green "Save" button. Subsequently, the editing mode closes and the section updates, integrating the changes. To exit the editing mode the user should click on the red "Discard" button or press ESC to exit the editing mode. All changes to the content will be discarded and can not be restored. If other users have edited the document shared for review, you can see all of suggested changes they've made. In order to do so, the function "Show suggested changes" should be activated with a tick in the "Show document options" located on the left side of the tab bar. Afterwards, you can either accept/reject all of them or decide on each suggested change separately. If the function "Show suggested changes" is off, the document will have the so-called "clean view". A review section can also be divided. To do so, the user must click anywhere in a section (but not at the beginning or end of the section) and press the "Enter (RETURN)" button. The small dialog box asking "Would you like to split the section? Yes, No" will appear. If the user clicks "Yes", the section will be split and the contents after the cursor position will be set to "suggested for deletion". A new draft section will be created and the content of the previous section suggested for deletion applied. If it is a numbered section, the numbering will be set automatically after the split. A user can change an existing image section and replace the image via the context menu. Click on the button or double-click on the image to open a dialogue window. Here the user can either replace the exisiting image by adding a new one via Drag & Drop or search for a new image in your local data. To delete the image a user can either press the "trash can" button or use the Backspace key. To save a newly inserted image, click on the "Save" button or use the shortcode CMD + S (STRG + S). SMASHDOCs integrates and saves the new image in the section. Click anywhere outside the dialogue window or on "Cancel" to exit the editing mode. All changes will be discarded, and the image section remains unchanged. When adding a new image in review mode, a user can either save it as draft first (others can see but not replace or comment on it) or share it for review right away. 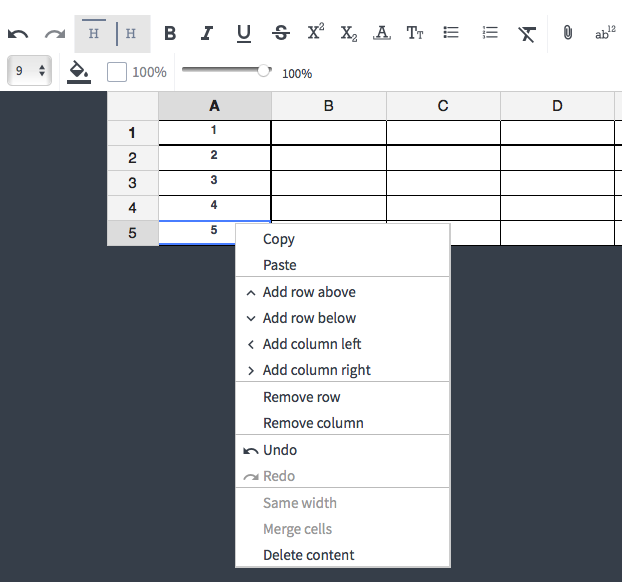 A user can edit a SMASHDOCs table by double-clicking on it or via the "Edit table" function in the context menu. In the appearing dialogue window, the user can make changes to the table's content, add, merge or delete new rows and columns change the table's title or adjust its size. The standard editing mode is activated if a user just clicks into a cell and starts typing. When enhanced editing mode is activated all formatting options just work for the content in the cell which has been selected by the user. If a user wants to discard changes, either click on "Cancel" or anywhere outside of the dialogue window. The table will reset to the former version. To save changes either hit "Save" or use the shortcode CMD + S (STRG + S). To delete the table a user can either press the "trash can" button or use the Backspace key. Like images, a user can save newly added tables as draft or share them for review. To create a new section, user has to click on an existing section and press the ENTER button. After the user makes the selection, a new design section is inserted as a draft below the focused section. The avatar on the left side of a draft sections shows the section creator. Draft sections can be repositioned within the document just like checked-in sections, but only by the draft section's creator. NB: The button "New section" is only displayed when the user holds at least the role of "Editor". Clicking anywhere out of a section or stopping to write automatically saves a new section as draft, meaning it is not possible to review it just yet. Other users can see and read these draft sections in the document, but are not allowed to edit them. The sections are marked with the creator's avatar as well as a background highlighted in color. To discard changes or delete a newly created section, click on the "Delete" button in the context menu. SMASHDOCs visually enhances newly created draft sections within a document to distinguish them from reviewable sections. 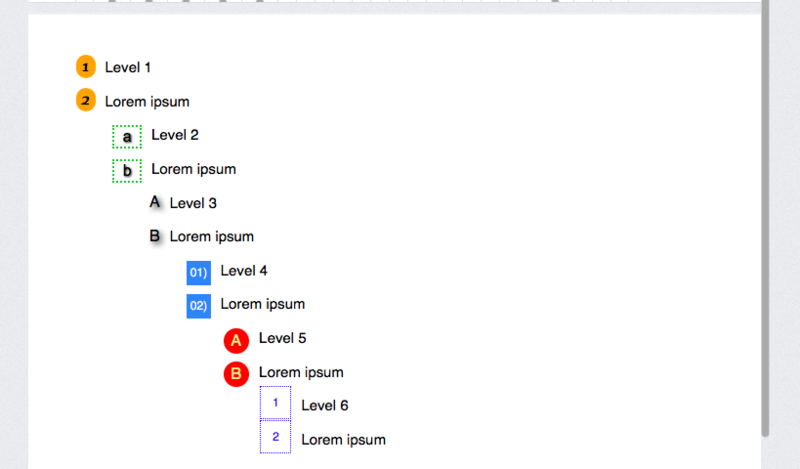 The creator of a section sees them with a solid coloured background while other users' draft sections are displayed with a hatched background. Additionally, the creator's avatar is displayed left of a draft section. As soon as a draft section is shared for review, the background, as well as the creator's avatar do not show anymore. Furthermore, empty draft sections can be deleted at any time, even if they were created by other users and (still) haven't set for review. As soon as the editor begins to type, this is not longer possible. Sections saved as drafts can not be edited, until the creator shares them for review by clicking on the blue "Share for review button". The shared section is then displayed as a newly inserted section in the change view. For all users other than the creator, it us highlighted as "unseen". NB: if a user is admin and/or has the role "approver" in a document, he can also set other people's draft section to review or delete them beside his own draft sections! All user's draft sections are summed up in the list "my draft sections". Look it up in the tab bar on the left side. The grey number shows how many draft sections the user have in the document. With this list the user gets an overview of all his own draft sections. Click on a section in the list and will open the corresponding section in the document. Additionally the user can set the draft section for review with a click on the blue button. The user can also set his own draft sections for review all at once by clicking on the blue button "Share all". All open changes to the document are displayed in the tab bar on the left. All pending changes mean all open changes in the section about which the user has not decided yet. If there are pending changes, the meter in the tab bar left turns grey. If the user has decided on all changes, changed sections are marked as done and the tab for "Show open document changes" in the tab bar on the left disappears. As a document can contain a large number of changes during its review process, it can be helpful the approve all changes at the same time, meaning accepting or discarding them all at once. Therefore there are buttons "Accept all" and "Reduce all" button in the page header of a document. It only shows for users, that are at least "Editors" to the document. They document adjusts according to the selected option. Accepting or rejecting changes of a section works the same way as approving all changes in a document, provided that the user has the required role. As soon as there are changes in a document, the user can use the "Accept" or "Reject" buttons in the context menu to decide upon those changes. User can also use the shortcut (Сtrl + Alt + Y) for Windows / (CONTROL + ALT + Y) for Mac for accepting new changes and (Сtrl + Alt + N) for Windows / (CONTROL + ALT + N) for Mac for rejecting them. Default setting "Approve all pending changes in a text section with one click"
When choosing one decision button, it applies to the whole section. Depending on the user's choice, all changes within the section get accepted or rejected. It is possible to retrace all decisions on a section in section history. In this mode, a user cannot approve all pending changes in a text section by just clicking somewhere into the section. He should either select one word or several words suggested for changes individually. Only then the decision buttons will be displayed. The selected suggested changes will be accepted or rejected depending on the chosen decision button. If the selected words do not contain any change proposals or the user clicks outside of any word in the text section, the decision buttons will not appear. A user is able to activate this mode in his user settings. SMASHDOCs highlights all unseen changes in a document like insertions and deletions of words or whole sections in color. The SMASHDOCs technology makes this possible, as it tracks every user's last login to a document and all changes that were added since then. Unseen change suggestions which have not yet been decided upon, are highlighted in green (insertion) or red (deletion) on a yellow background. Unseen decisions are highlighted in green on green background (accepted insertion) or in red on red background (accepted deletion). Furthermore, a blue eye symbol is displayed right of the respective section. With a click on the eye, a user confirms that he has seen and taken not of the change in question. All changes in a section can always be tracked in the section history. If a section contains unseen changes, the respective entry in the change history gets highlighted with a yellow background. Apart from unseen changes in text sections, SMASHDOCs also highlights updated versions of image sections individually for each user. Like unseen and undecided changes in a text section, newly added images are highlighted in yellow and marked with a blue eye next to them. Unseen tables or changes in tables are highlighted the same way, with a yellow background and the blue eye. Different from text or image sections, clicking on the eye symbol does not only register the table as seen but also opens the history. As SMASHDOCs tracks changes for each section separately, a user can quickly see which sections got reviewed. SMASHDOCs creates and continuously updates a list with all changes for the user. Especially in large documents it is possible to reviewed sections with just a few clicks. The list is displayed in the tab bar on the left, as soon as there are unprocessed changes. If there are unseen changes, the number of those unseen changes is displayed with a red counter. As soon as you processed all changes, the tab disappears. Clicking on the tab "Changes" displays the complete list. As per default, the filter is set to "Unseen", provided that there are still unseen changes in the document. If there are no unseen changes, the filter switches to "Open", displaying all changes, which have not been decided upon yet. When choosing an entry from the list, the document navigates to the respective section. To better identify unseen changes in a document, the blue eye symbol is displayed in the list of changes as well as next to the respective section. Regardless of the role a user has, the system checks which changes were added to a document since a user's last login. All those new changes get highlighted and marked with the eye symbol. Clicking on the symbol marks the changes in a section as seen, the eye and the yellow background disappear. When clicking on a change in the list of changes, a user can choose to show section history at the same time. There are more details about who changed what and when. For more information, see chapter 3.7.2 . NB: To be able to approve open changes, the user has to have the role "Approver". All other user roles do not allow approving changes. When approving via the list of changes, all changes within a section are accepted or rejected. When approving via the context menu, the user can either accept or reject all changes or approve each change separately. Select the words you want to approve and accept or reject the change. All other changes in the section remain unprocessed. The "Accept all" and "Reject all" functions lets a user accept or reject all changes in a document at once. Each section in SMASHDOCs has its section history, where all changes in that section are displayed chronologically. Each user can exactly retrace what changed in a section and who made the changes. As long as there are no changes in a section, the history can only be accessed via the context menu. When there are already changes in a section, the user can also access the history via the version number of the respective section. This number indicates the number of changes in a section. Regardless of the extent of the change, each editing process only counts once, meaning that it does not matter if a single word or more text was changed. The section history also shows if a change was accepted or rejected. Depending on the decision, a green check mark (for accepted changes) or a red "denied" symbol (for rejected changes) is displayed in the header of the history entry. The redline also shows in the section history, unseen changes also come with a yellow background. A user can access the section history with highlighted unseen changes via the list of changes in the side bar. To display the change history of a section, tick the respective box in the list of changes. Clicking on a change from the list then shows you the edited section in the document along with the section history on the right side of the section. Unseen change entries are highlighted with a yellow background. For every section with at least one previous version, a user can restore and turn this old version into the latest again. For every history, users who are at least "Editors" can use the "Rewind" button to restore this entry. Click on the button to open a dialogue for restoring the selected version. On the left side, there is the current version of the section, while on the right there is a preview of the version to be restored. Click on "OK" to restore the selected version. Restoring section versions is also tracked in the history. 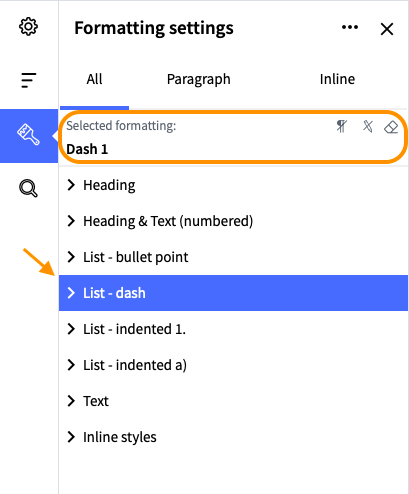 SMASHDOCs offers a quick access to specific text content / style with the help of search / replace function. A user can find a specific word or phrase easily. Click the "Search / Replace" button on the left-side bar. The dialog window appears with text-box, where the user can type in specific phrase or word for search. The results will appear after clicking "Search" button. If the parameter "Text sensitive" is on, the upper- lower-case letters will be considered as different symbols. If the parameter "Text sensitive" is active, the search results will fully correspond to the text in the search-box: the spaces, upper- lower-case letters will be taken into account. In order to replace the results of the search with another text user can type in the desirable word of phrase in the text-box below. User can replace all search results at once or decide on each individually. A user can also search a specific style used in the document. In order to replace the results of the search with another style user can choose the desired style in the drop-down menu below. Hence, the user can replace all search results at once or decide on each individually. Users with respective rights can create comments for each section of a document. There is no limit to the number of comments per section or document. Create new comments via a section's context menu. The user can access it by clicking on a section. Also, it is possible just comment on certain words by highlighting them and clicking right to open the context menu or using the shortcut (Ctrl + Shift + C) for Windows / (CONTROL + SHIFT + C) for Mac. After clicking on the function, a comment box appears next to the selected section. The window contains the following elements. It is not possible to create empty comments. If you try to save a comment without content, you get a warning when pressing "Create". By default, the recipient of the comments is always the creator. Though it is possible to add individual users later on. The option "visible for" has several variations: "All" - that means that the comment can be seen by every user with access to the document. The setting "Selected" allows you to individually select the document users you want to see your comment. If you create a comment for selected users an additional input box appears for adding those users. You can only select users with access to the document. Comments are generally created with the status "pending", for example when you want to discuss a section's content in detail without editing it right away. Sometimes, though it makes sense to create a "resolved" comment, when you want to indicate that a certain decision has already been made and there is no need for discussion. You can change the status at any time. If a comment was originally created as "pending", you can always resolve it once you want to indicate that a topic has been completed. Changes in a comment's status are recorded in the comment history and are visible to other users. The comment history also indicates who created or replied on a comment and when. The user can also determine if the comment becomes visible in export. Only if the option "Visible in export" is activated will the additional setting "Export comments" appear while exporting to Word and sdox. The mere display of the conversation tab in the tab bar on the left indicates that there are conversations within the document, none of them unread. If there are unread conversations a read counter appears next to the tab. It only counts conversations as a whole, not individual answers. So, a comment with three unseen answers only counts as one conversation. The green check mark at the conversation tab indicates that all existing conversations are "resolved". If there exist conversations for a section a user can see them by clicking on the speech bubble icon right from the section. Contrary to the tab bar the details do not show on the left but right from the section. Clicking on the respective tab opens a detailed view on comments or questions with an overview of all conversations. In case there are new conversations the tab "Unseen" is displayed. Unseen conversations are also highlighted. As soon as all conversations got marked as seen the "Unread" tab disappears. If there are no unread conversations the tab "All" is displayed. All unread conversations can be marked as read with the click of the eye symbol in the upper left corner. In addition, there are two tabs showing all pending and resolved conversations in the document. The user can also search for all conversations, filtering the search results by creator or commentator. To write an answer for an existing conversation you need to access the conversation details. You can either display them via the tab bar on the left or the speech bubble symbol next to the section. Then you choose the respective conversation with a click. The detailed conversation history with all posts appears including an input box for your answer. To send an answer a user can also use the shortcut (Tab + Enter) for Windows / (TAB + RETURN) for Mac. Clicking into the input box automatically marks an unread conversation as read. A conversation status is displayed with the help of colors. Unseen conversations are highlighted with yellow. There is an option to mark the selected persons, as administrators of the comment. If a conversation is only visible for the creator or selected users you can add more users to it. Click on the plus button located on the bottom of the opened comment box. A dialogue box appears and new users can be added to the conversation. To do so, just add the names of the relevant users and confirm it with a click on the blue button "Add". By clicking on the button "Invite", the indicated users are added to the conversation. NB: only people invited to the document can be included in the communication. Conversations that are only visible for the creator or selected users can also made public directly for all document users. Again, click on the plus button located on the bottom of the opened comment box. In the appearing dialogue box choose "public" and confirm your decision with a click on the blue button "Make public". NB: once a conversation is visible for all document users, you can no longer make it private again. Apart from communicating via comments, user can also write an announcement for a document. Unlike comments, an announcement does not show in a document but is e-mailed to the recipients. The e-mail also contains a link to the document. Announcements are helpful for communicating further detail during the editing and consolidation process, for example concerning new changes or the progress of a document. The creator of the announcement can manually choose the recipients. Useres can send us all kinds of support requests via the support button right next to your user avatar in the upper right corner. Clicking on the button opens a contact form, where you can describe your inquiry in detail. A red dot near the user`s avatar and option "What`s new" in the menu below signify that there is a new feature release. "What`s new" directs the user to SMASHDOCs blog with the latest release notes. Once the link "What`s new" has been opened, red signs disappear. The document creator is the only one with access to a document when it is in draft mode. Other users can not see the document, so only the creator can start the review mode and invite more users to the document. As soon as the creator starts the review mode he can also add other users to the document. The creator has two options for sending out invitations. He can invite new users via their e-mail address or search for them by name. The second option only works if he has already worked with these users in the past. SMASHDOCs shows search results once you start typing the first letter. The user can then be added to the invitation list with a click on the green "Plus" button. As a creator, you can also assign roles and additional rights to the invitees and add a message to your invitation. Click on "Share and track the changes" to start the review process. Your document view changes accordingly from draft to review mode. You can also start the review mode without inviting other users. Of course, you can still invite them later on. You can add users to a document in review mode at all times. Go to "Options" choose "Invite users" to proceed. This is only possible if you have the additional right to invite other users. If the user wants to invite another user to the document, he may start entering the particular name (in case he has already shared something with the recepient) or a particular e-mail address. In addition, when inviting the user, the entered e-mail address will always appear in the drop-down menu if that user has previously participated in the review process of any other SMASHDOC document. In SMASHDOCs it is possible to attribute roles and additional rights for each user and document separately. Depending on his role, a user has a varying degree of editing rights for a document. The additional rights provide the user with further possibilities concerning the management of a document. The document creator automatically holds the role of "Approver" and all additional rights. A "Reader" can only access the document without editing any content, posting or replying to comments and questions. As "Commentator" one can post questions and comments, and also reply to conversations posted by other users. "Editors" can create conversations and also edit a document's content. This includes creating, changing and deleting text, as well as adding or changing images and tables. In order to be able to accept or reject changes in a document, you need the role of "Approver". Only approvers can decide upon suggested changes, edit content themselves, including to delete images or tables, and create conversations. The role is displayed in the settings. First of all, invited users are listed in the document as "active". That means, they can work in the document according to their assigned roles and rights. However, users can be deactivated from the document when required, so that they don't have any access to the document anymore. To deactivate a user, simply select the “User list” of the respective document (see chapter 5.3) and remove the tick mark next to "Active". The only condition is that you are the document administrator. Deactivated users will be immediately notified by email and no longer be able to see the document in their document list. In case a user opened a document while being deactivated, he won’t be able to work on the document anymore and will be informed about the deactivation in a dialogue window. A deactivated user cannot find the document using the search function and isn’t able to access it via the document link. Please note, document admin users can only be deactivated if there is at least one document admin user left after the deactivation. But SMASHDOCs prevents that automatically. Deactivated users immediately disappear from the list “Active” and are displayed only in the list “Inactive” from then on. There you can again reactivate a deactivated user by putting a tick next to "Active". Then the reactivated user appears in the list “Active” again and will be automatically notified per email. The user is now able to see the document in his document list again and to open it. Of course, you can deactivate yourself as well, but please be aware that only a document admin user can reactivate you again. On top of the roles there four additional rights existing in SMASHDOCs. The additional right "Admin" allows a user to chance the roles and additional rights of other users. In order to invite further users to a document, you need the right "Invite". It also enables you to attribute roles and additional rights to the invitees, however only up to your own level. A user with the role of "commentator" can hold the right to invite others, but can not invite them as "editors" or "approvers". This limitation also applies to the additional rights. To see the section history of a document, one needs the additional right "Section history". Without this right, it is not possible to follow the changes made to a section. The user with the "Admin" role additionally has a control whether the user he invites sees the "Export" option in the document or not. If an admin changes the rights setting while this user is already working in the document, the change will take effect immediately. If the right to export no longer exists, then user can also no longer duplicate it. The two rights "Admin" and "Invites" need to be attributed at least once for a document. One user can either hold both or two users each hold one right. For an overview about all users working together on a document, click “Manage users” in the "Options" of the document. In this list all users are listed with their user role, additional rights and activity level. For the sake of enabling other users working on the document to know who is currently editing the document as well, the user avatars on the top right of the document are shown. As it is called active users toolbar, active users marked with the small green sign are shown first in the list. If there are many users involved in the document editing, only a few icons will be displayed followed by the "+10" etc. number depending from the user quantity. On the left side of the above mentioned toolbar are the control buttons e.g. Share all, Accept all, Decline all, Mark all as read. The short name of the user e.g. 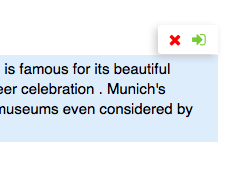 EM for Emma Müller is displayed on the avatar if the user hasn`t installed any photo or image. If he did, then the user should mouse over the avatar in order for the full name of other users to be shown. Furthermore, the click on an avatar opens the "Manage users" window. In order to edit the master data of your account, click on you avatar and choose "Settings" tab in the submenu. In the dialogue box "Profile" you can change your profile data like name and company. Save your changes by clicking "Save settings". NB: It is not possible to change your E-mail address. Upon registration, the system creates an avatar for each user, consisting of his initial letters. For uploading your own profile picture or replacing an existing picture just click on your existing profile picture. In the following dialogue, you can search your local drive for a picture and upload it and adjust the image size. A user can change the language settings even after having registered. Therefore go to the tab "Settings" in your account settings. Currently SMASHDOCs supports English, German, French and Russian languages. A user can decide whether to activate or deactivate tooltips in SMASHDOCs. This can be done by un-ticking the box in account settings. When you are logged into SMASHDOCs you can change your password in your account settings under "Security". When changing your password you have to enter your current password, your new password and confirm the new password again. The new password is active upon your next login. If you want to change your password without logging in before or if you forgot your password, you can request a new one via the login dialogue. After clicking on the link a new dialogue box appears. Enter your email address, select "Request your new password" and you will get an email with further instructions to create a new password. You can export documents as Word documents in no time and it does not matter whether the document is in draft or review mode. The export function can be found in the "Show document options" menu. Select a design template for the document output. You can choose between the templates "Standard" and "Contract". Upon request, SMASHDOCs can create and deposit predefined, custom-tailored templates. Feel free to contact smartwork solutions for further information. Formattings such as block headings, figure and table numberings allow you to automatically create document elements such as a table of contents and lists of figures and tables. Just select the respective checkbox in the dialogue window. Click on create and the document downloads on your computer. You can open it with Microsoft Word or any other software, that processes Word Documents. The settings from the Word formatting templates are taken over. User can also use a shortcut (Ctrl + E) for Windows / (COMMAND + E) for Mac. SMASHDOCs documents can also be issued as HTML pages. In this case, there is a difference between draft and review mode, as there are more export possibilities available in review mode. The document is displayed without redline and conversations. It corresponds to the "Clean" view of a review document. As there are no tracked changes and conversations in a draft document, it is the only mode available for both, documents in draft and review mode. The document is displayed including the redline and all conversations. New changes and conversation posts are highlighted with a yellow background. You can choose if you want all conversations to be displayed or only public ones. In addition to redline and conversation posts, this mode also shows the full history of every section, if changes have been made to the section's content. Here you can also choose between public and non-public comments. In this HTML mode the focus is not on the document itself anymore, but on all conversations, which have not been closed so far. This allows you to react to conversations more quickly. Because of the minimised display of the connected section, the context is still evident.